A little more about me today. If you are familiar with the symptoms of fibromyalgia, you might have heard the term “fibro-fog” describing those periods where you can’t think right, and sometimes suffer memory loss or have difficulty concentrating. It is a very real thing for us fibro-mates. I have experienced this feeling more times than I care to admit, and to this day my memory is not as good as it used to be. I was diagnosed with fibromyalgia in 2000, and have probably have had it since I was a teen. 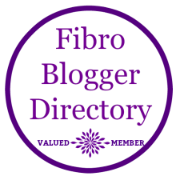 I have long considered myself a “highly functioning” fibromyalgia sufferer because no matter how crappy I felt, I have always tried to push through. I rarely take sick days so if I do, you know it’s bad. There have been plenty of “mack truck mornings” in the last 15 years, but THANKFULLY those days are fewer and fewer for me. I still have flares occasionally, but they are not as bad or as long lasting as they once were. After years of various medications and trial and error, I believe I have found what works best for me. Disclaimer: I am not a doctor, nor do I play one on TV. I have not received any sort of compensation from any of the people/sites I mention later on. I have just done lots of research and been to my fair share of doctors. But I am a firm believer in a more natural approach as I seem to have severe reactions to many medications I am prescribed. I believe in letting the body heal itself – this is what works for me. These are my opinions. A few weeks ago I remembered a time when I was 16 that we thought I had mononucleosis. I was suffering from extreme fatigue and had lost a lot of weight. My mother took me to the doctor where they ran tests for mono, strep, etc., and treated me with ampicillin for some infection I cannot recall. At the time I was a vegetarian too, and I can remember my mother telling me that if the doctor thought that was why I was sick, I was going to have to eat meat again! I ended up quitting my part-time job for several months due to the fatigue. I think this illness at 16 must have been my trigger for fibromyalgia, or the first bout I had with it. About 8 years ago I heard about Dr. Murphree from a friend whose wife also has FMS. I looked him up and signed up for his email newsletter. I listened to a few of his teleconferences and started researching vitamins and minerals that I needed. I ditched all of the medications and started taking various supplements morning and night. This seemed to help, but I was starting to experience more frequent digestive issues and had a series of health issues from 2011-2012. In 2012, one of Dr. Murphree’s newsletters led me to JJ Virgin and her book The Virgin Diet. Now I have always been relatively slender and I work out regularly, but the premise of her book – ditch 7 foods for 7 days and lose 7 pounds – intrigued me. It wasn’t so much the possibility of losing weight as it was finding those foods which trigger bad reactions and are most likely to cause the inflammation in my body. Since my teens and 20s I have had various reactions to what I thought was yeast – breads, cakes, and later wheat beers. Turns out it was probably the gluten and sugar. So I did the trial and found that wheat, sugar, and dairy are definitely triggers for me. For the most part, I have ditched gluten and dairy, but I do occasionally cheat. And my stomach will pay the price. 1. Exercise. I exercise daily if possible, usually first thing in the morning. I walk on the treadmill or elliptical, walk the dogs, do yoga or pilates, and use light weights. I aim for 30 minutes a day for at least 6 days. There’s usually one day a week that I am so tired I cannot get up to work out during the work week. 2. Diet. As I said I avoid certain foods and artificial ingredients. I also prepare most of my own meals and rarely eat out. Sundays are a big meal prep day for me. And they wear me out. But it’s worth it. a. My breakfast is usually a protein smoothie with almond or coconut milk, pea protein powder, fruit, kale, and chia or flax seeds stirred in at the end. Also 1-2 cups of black coffee. b. My lunch is usually chicken/veggies/rice or a chicken salad or leftovers or hummus and veggies. c. Dinner usually contains lean protein, veggies, and rice. d. I drink a lot of water. Hot water with lemon. Iced water – plain or fruit-infused. e. I usually allow myself some dark chocolate or homemade protein balls or granola bar, and usually almonds and fruit are my snacks during the day. f. At night I sometimes drink hot herbal tea to help with digestion. 3. Accountability. I use a FitBit fitness tracker and MyFitnessPal app. These two items help me be accountable to myself. 4. Supplements. At night I have reduced the number of supplements I take, as I don’t feel the body can absorb all of those things and it is better to get them through your food. I take Calcium + Vitamin D (otherwise I wake up with ferocious leg cramps, plus it’s good for my osteoporosis), Fish Oil (to help with the inflammation and brain health), and a probiotic (for digestive health). 5. Not trying to do it all. I have had someone else clean my house since right after being diagnosed. I don’t get my nails done. I don’t eat out. I would spend a day or two in bed after cleaning my house, so this is my splurge. My husband and kids do their own laundry and help with chores around the house. They understand my condition and don’t demand things of me – I am the one putting pressure on myself to try to do it all. 6. Attitude. Again, I have had my fair share of being sad and depressed about feeling like crap and not being “superwoman,” but attitude is a powerful thing in the battle of one’s health. So I choose JOY. I smile. I try to always believe that my glass is half full. Notice I didn’t mention sleep, because that is one area where I am still lacking. Six hours of sleep is a great night for me, but five hours is the norm. And it’s even better when I can sleep straight through. This is an area I am working on, but for now life is good. I hope this helps give you some ideas about what has helped me with my FMS struggles. (Click the links for additional reading.) Do you have other things that have helped you? Your approach sounds very much like mine, I did start taking melatonin about 8 weeks ago (3mg at night with my 500mg magnesium and 50mg zinc). It has helped me a great deal and it hasn’t stopped working, I am still using just 3mg. I take Valerian sometimes instead of melatonin. Somewhere many years ago I read that people with fibromyalgia shouldn’t take melatonin, but I don’t recall the reasoning. I was sometimes taking Valerian too, but if I took it more than twice a week, I would end up having to take more, which was frustrating. I read a lot of conflicting information about melatonin actually. It took me a long time to try it. Glad I did, but know it might be different for others.